Q. How do I cite a state statute using proper legal citation using Bluebook guidelines? Consult the Indigo Book for all of your legal citations. Paralegal course assignments require legal resources to be cited using Bluebook guidelines. The Indigo Book is what students should use for help using The Bluebook's Uniform System of Citation. Students have access to the free Indigo Book on the School of Justice Studies Guide. 1. Refer to the Bluebook tab in the School of Justice Studies Guide. 2. Make an appointment with a tutor using Tutor Match. Select Paralegal in the School drop down and then pick Bluebook. 3. Consult Cornell Law School's LII website for guidance in creating legal citations for a variety of legal resources (see below). 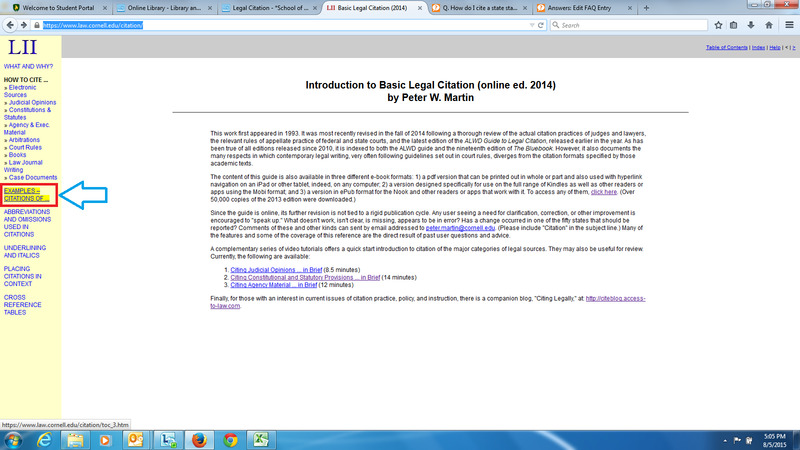 "Introduction to Basic Legal Citation" by Peter W. Martin provides examples and explanations of citations for a variety of legal resources. 2. Click on the link "Examples--Citations of" on the left side of the page. 3. Next, click on the link "Constitutions & Statutes" on the left side of the page. 4. Scroll down to the section "State Statute Citation" and click on the state of interest. 5. View examples of legal citations for state statutes and Constitutions. If you are trying to cite a state statute in APA style, please consult the Legal Materials page in the APA Guide. If you are unsure if you should use APA style or Bluebook, please consult your assignment instructions or ask your instructor.